Norma Jean Frakes, 87, of Webster City, died Friday, June 22, 2018 at Crestview Nursing and Rehabilitation. Funeral services will be held at 1:30 p.m. on Wednesday, June 27, 2018 at Foster Funeral and Cremation Center, with Rev. Chad Halbach officiating. Burial will be in Cass Township Cemetery. Visitation will be at the Foster Funeral and Cremation Center from 12:00 p.m. until service time on Wednesday. Norma Jean Segar, daughter of Charles and Anna Pavey Segar, was born on September 26, 1930 in Hamilton County. She graduated from Lincoln High School and Webster City Junior College. She married Ilo Patrick Frakes on June 4, 1949 in Hamilton County. 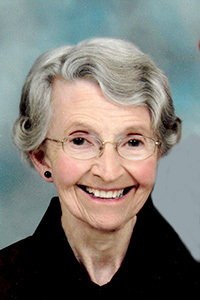 She began her career as a school teacher and later worked for the Iowa Department of Human Services as a social worker. She retired in 1988 after 32 years of service. Norma Jean is survived by her daughter, Kathy Kolbeck of Webster City; her son and daughter-in-law, Brenton (Melissa) Frakes of Waddell, AZ; two grandchildren, Misty and Jamie; four great-grandchildren, Noah, Jenna, Cody and Casey; many nieces and nephews. She was preceded in death by her parents; husband, Ilo in 2012; son-in-law, Doug Kolbeck; siblings, Marian Stuart, Verne Segar and Duane Segar. Norma Jean was a member of the Church of Christ. She enjoyed baking and spending time with her family. In lieu of flowers, memorials may be given to the Church of Christ. Condolences may be expressed online at www.fosterfuneralandcremation.com.